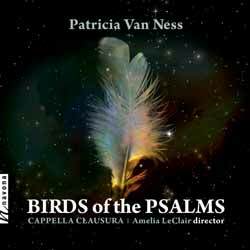 This collection of choral work ranges from Henry Purcell's 17th-century 'Hear My Prayer' to contemporary composer Patricia Van Ness's eponymous choral cycle 'Birds of the Psalms'. The latter, a selection of ten psalms scored for a cappella choir, constitutes the album's focal point. Conducted by Amelia LeClair, Birds of the Psalms is, at times haunting and beautiful, and at others primeval and chaotic. The album contains 16 tracks (51 min, 53 sec) and is not only a wonderful album for lovers of choral music, but also a great place to start if you're a novice. The performances are perfect and the production is flawless.